Why Did Jesus Say Peter Was The Rock On Which The Church Would Be Built? A common belief of millions of professing Christians is that Peter was designated by Jesus to be the foundation or head of the church. 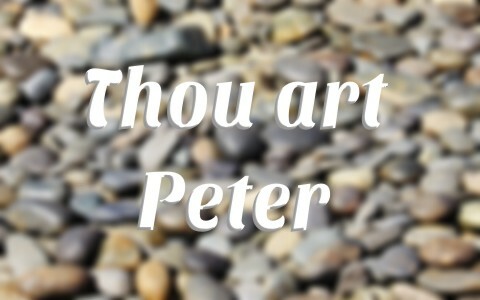 Because of this, great honor is paid to Peter to this day by these same professed believers. When asked why they believe this, many will quote Matthew 16:18-19 as the answer, explaining that Jesus said Peter was the rock on which the church would be built. If this is true, why did Jesus say Peter was the rock on which the church would be built? To answer this, the text in context of Matthew 16 needs to be studied. What is the context of Matthew 16? Jesus had just arrived with the disciples at Caesarea Philippi, about 25 miles north of the Sea of Galilee. He had just left Magdala, which was on the western shore of the Sea of Galilee, where he had just debated with the Pharisees and Sadducees who wanted him to produce a sign from heaven to verify who He was. Jesus warned the disciples to beware of the leaven of the Pharisees and of the Sadducees. The disciples did not understand what he meant by warning them to beware of leaven. Jesus explained to them how He had earlier told them not to beware of the leaven of the bread miraculously produced, but of the doctrine of the Pharisees and of the Sadducees. This encounter left the disciples with the idea of people wondering who Jesus was in their minds. What did Jesus mean by building His church upon a rock? At Caesarea Philippi, Jesus expounded upon this thought when He asked the disciples, “Whom do men say that I the Son of man am?” Their answers varied. They said that some said that He was John the Baptist, Elijah, Jeremiah, or one of the prophets. Jesus then asked them directly, “But whom say ye that I am?” Simon Peter answered and said, “Thou art the Christ, the Son of the living God.” Jesus responded to Peter by saying, ‘Blessed art thou, Simon Barjona: for flesh and blood hath not revealed it unto thee, but my Father which is in heaven. And I say also unto thee, That thou art Peter, and upon this rock I will build my church; and the gates of hell shall not prevail against it. And I will give unto thee the keys of the kingdom of heaven: and whatsoever thou shalt bind on earth shall be bound in heaven: and whatsoever thou shalt loose on earth shall be loosed in heaven’” (Matthew 16:17-19). So, what did Jesus mean when He referred to building His church upon this rock? First, Jesus stated that Peter did not come up with his answer on his own, but that it was revealed to him by God the Father in heaven. Second, when Jesus said, “…thou art Peter, and upon this rock I will build my church…”, He was making two linguistic points. The first point was a comparison of the name Peter to the word rock. The New Testament was written in Greek. The name Peter in Greek is petros, meaning a pebble or small stone. The word for rock in the Greek is petra, meaning a massive rock or bedrock. Jesus was making the linguistic point that this simple truth that God had revealed to Peter, the pebble, about Jesus being the Christ, the rock. It is clear from these passages that the church was built upon Jesus Christ, not Peter. Consider for a moment what Jesus said just afterwards to Peter in Matthew 16:20-23. Jesus told the disciples not to tell anyone that He was the Christ. Then Jesus started explaining how He must go in to Jerusalem to suffer and be killed and be raised again on the third day. When Peter heard this, he rebuked Jesus! Peter told Jesus to stay away from there so that it doesn’t happen to Him. Jesus responded by telling Peter “Get thee behind me, Satan: thou art an offence unto me: for thou savour rest not the things that be of God, but those that be of men” (Matthew 16:23). Focusing on what Jesus said to Peter, it is hard to believe that Jesus would have meant that He was going to build His church on Peter, whom He referred to as Satan and an offense. To suggest otherwise, would mean that Jesus was mistaken about Peter or that Jesus would build His church on satanic man-made values with Peter as the head. While it is clear that some churches have built their foundation on satanic man-made values, this was not the foundation that Jesus built the church upon. Many professing Christians believe that Peter was designated by Jesus to be the foundation or head of the church. They base their belief on an out of context interpretation of Matthew 16:17-19. Instead, Jesus referred to Peter being a small pebble that understood the real foundation of the church, Jesus Christ. Reading this passage in proper context along with supporting verses shows us that Jesus is the Christ, the Rock of our salvation. Very well done. I’ve often had this debate with other Christians over the meaning of this passage. As always it’s always prudent to read any scripture within context of the whole Bible. Thanks for your comment Tony. Yes, as Peter said, no prophecy of Scripture is of any private interpretation, but holy men of God spake as they were moved by the Holy Ghost. We must let the totality of the Scripture interpret for us the meaning of every passage. This is what amazes me when a theologian of notariety makes a heretical statement saying that Paul and others didn’t know or were ignorant about certain topics, but we know better now that what he taught was wrong. This proves the that they really do not understand that even if Paul could not envision what man says is normal today, the Holy Spirit certainly knew when He inspired the prophets and the Apostles what to write. To say that the Word of God is a myth, full of errors and contradictions is to say that Jesus is a myth, full of errors and contradictions. John 1:1,14. Thanks be to God for His Word. 1 Corinthians 1:30: 2 Timothy 3;1-17. I have evan a print out about this issue,and it states the the sins of Peter above,but when I look up above I can`t see any. I was brought up a Roman Catholic,but I am a born again Christian now. I have been on this site about 5 yrs now,and I know Jack really well. This always crops up who is the head of the Catholic Church,and they always answer Peter because of what Jesus said. I have told a few that he is not the head of the church,but they always fall back on to what Jesus said so why don`t they understand it like the way you put it. It`s their in Black and White what Jesus said to Paul “Thou art Peter and I will build “MY CHURCH”. So evan the Vatican and all it`s bishops,and cardinals take this wording,and say Jesus made Paul the head of the church on earth. They know it`s Jesus`s church,but the pope is the leader of the church on earth. So why does the Vatican believe this,and you are talking about learned men who have studied the bible the same has you. This statement has still got me baffled today. I know who the head of the church is Jesus,but try telling that to the catholics! I am a Catholic! Of course Christ is the head of the Church! The Pope is only a human leader heading the Catholic Church to guide it. Everyone has a leader. The Pope does not claim to be God nor do we believe He is God. The Catholic Church believes and follows what is from the Bible but Tran so many different sects including born again change and interpret the word according to their belief. There is no root or grounding and is newly established unlike the Catholic Church which was found centuries ago. Hello Mr. Rodirgues. I know many Catholics are saved but by praying to and through Mary we are breaking Jesus’ command to pray through His name alone and He also said, “Call no man father,” so I have many issues with the Catholic Church. Just because they’ve been around a long time doesn’t mean it’s the only way or the best way. Anthrax has been around for a very long time and we can’t say that’s good just because it’s been around a long time, because the Islamic faith has been too. I pray you see the Pope as only a man and a sinner, like we all are. Sorry I have been away quite some time now due to a problem with another site which was sending me emails to buy tops and hoodies with slogans on them. I thought this site was shut down because I never received any emails. PJ you are quite right to point this out. I just can`t believe how the Vatican can come up with this definition of what Jesus said and meant. You are talking about millions of people who believe in what the Vatican says. Surely they must know the meaning of this what Jesus Himself said but they don`t and I have had quite a torrid time with this guy who was in charge of this site who was a Catholic told me if I posted this again I would be removed from the site. I WAS REMOVED and never went back. At Caesaria Phillipi is the Temple of Pan. In the cliff wall is a cave with water coming out to start the Jordan River. This is called the gates of hell and in the water is a rock 5 foot wide. Human sacrifices were conducted on that rock and if the blood was seen down below it would indicate their gods approval of the offering. It was probably the most vile place on earth. God being sovereign makes his claim amidst this evil place. There were 4 rocks there, not three, and the gates of hell were represented both literally and symbolically. Thank you sir. I think the overwhelming point is that Jesus found the church and He is the Head of the Church and no man…and that is the point of this article. Thank you for adding to our knowledge. I had not heard about the gates of hell being represented there. Interesting that Jesus would say that not even the gates of hell would prevail against His church, and yet many think the church is irrelevant. I like you mentioned Jesus calling Peter Satan because most people that discuss this verse leave this out. And is extremely important. Out of interest, why do you leave out the verse that immediately follows? After Jesus says, “And I tell you, you are Peter, and on this rock I will build my Church, and the gates of Hadesshall not prevail against it” he goes on to say to Peter in verse 19, “I will give you the keys of the kingdom of heaven, and whatever you bind on earth shall be bound in heaven, and whatever you loose on earth shall be loosed in heaven.”. In those days, the keys, of a typically walled city, were given to the Royal Steward when the King was away – in other words bestowed authority. This in itself doesn’t deny that Peter is a man. A separate point to those suggesting Peter is Satan, why would Jesus refer to Peter as blessed after Peter acknowledged him as the Christ in verse 17? (And Jesus answered him, “Blessed are you, Simon Bar-Jona! For flesh and blood has not revealed this to you, but my Father who is in heaven.) God bless you all on your journey in faith and search for the truth. Hello David. The church has the keys to the kingdom. If Peter were still in charge of the church then we’re in trouble. He’s dead. He’s not hear. Jesus, not Peter or Paul or any pope is head of the church. The statement “And I tell you, you are Peter, and on this rock I will build my church, and the gates of hell shall not prevail against it” is building on what Peter had just said..that Jesus is the Christ, the Son of the Living God. The church has prevailed, not Peter. Peter was blessed because he got to know that Jesus is the Messiah…most aren’t, so he is most blessed. No Scriptures were left out. THank you for yoiur comment sir.